In 2006, WSA’s sister organization, WorldSweeper.com, pioneered the concept of developing a U.S. “Sweeping Contractor Locator.” This was done in order to make it easier for those who hire sweeping contractors to find a sweeping company. Property managers found it convenient to use the Contractor Locator system to find local contractors, while others found it to be an efficient way to locate sweeping companies in an area remote from them. During collaboration sessions with property managers, these management professionals were asked if there was anything that might be done to increase their comfort level in their choice of a sweeping contractor. From the responses was born the idea of requiring that all contractors in WorldSweeper’s Contractor Locator sign a ‘Statement of Ethical Business Practices’ before being allowed to obtain a listing. Taking this input to heart, in 2007 WorldSweeper designed – with the assistance of leading U.S. contractors and others – a groundbreaking, written Ethics Statement for its Contractor Locator participants. To maintain their sweeping company’s listing on its renewal date in 2007/2008, all participating contractors were asked to sign this statement, copies of which are kept on file in the WorldSweeper offices. You can see the requirements below; or, click here for a PDF version of the statement. WSA members have exclusive access to the largest collection of ‘how to’ and ‘best practices’ information available anywhere. This includes over 250 articles that cover all aspects of running a professional contract sweeping firm. WSA member contractors are able to run their businesses using the latest in industry tips, techniques and manner of operation. This trove of information provides access to a level of training simply unavailable elsewhere. In addition to being the best trained and most professional, you can be assured that each WSA member has pledged in writing that their company will operate in an ethical manner. Take a look at the requirements of the World Sweeping Association Ethics Statement, spelled out below, and you can see why this is a proud part of WSA membership. If you are a property management professional, we encourage you to specify WSA membership as a contract requirement. At a minimum, you should require that any sweeping contractor you employ is willing to pledge its adherence to the tenets outlined below. Request to see the WSA Membership or Ethics logo from any sweeping contractor prior to signing a contract with them! We are confident that you will be glad you did. Insurance Company must carry a reasonable level of liability insurance and a copy of company’s Certificate of Insurance will be supplied upon request. If the contractor doesn’t carry liability coverage then the owner of the property on which an accident occurs is much more likely to be held financially liable. Workers’ Compensation Law Compliance Workers’ compensation insurance is carried on all employees and all subcontractors used are required to comply with such rules. Some companies cut corners by not paying the workmens’ compensation on their employees. Without it, there is a much greater chance that a sweeper operator who gets injured will successfully be able to sue the owner of the property for damages. Regulations Compliance with all local, state and federal regulations regarding both required licenses and the proper disposal of sweeping debris. Proof of proper disposal methods will be supplied to customers upon request. All required taxes are being paid, including all payroll, sale and fuel taxes. Legitimate businesses comply with ethical business practices, including all licensing requirements. Hiring companies deserve assurance that payroll and any other taxes required are being paid. In some states, the liability for some taxes may be passed on to the client company if they are not paid by the contractor. Likewise, client companies may have liability for any of its debris not disposed of legally and properly. If property managers do not provide an onsite container to dump collected litter, they should be able to confirm that litter from their site is being disposed of legally and properly. Employees Employees receive training for all equipment used and are provided with safe working conditions. All state and federal laws regarding compensation are followed. Employees who enjoy safe working conditions and who have been trained are more likely to do a good job and less likely to have accidents that result in injury to themselves or others. Also, client companies deserve assurance that all laws regarding employee compensation are being followed. General Business is conducted with honesty, integrity and projection of a professional image. Advertising is truthful and non-deceptive. Proposals shall be complete and accurate in describing services/products rendered. Much of the business of power sweeping is conducted at night, when property managers are not present. Since sweeping contractors represent their client companies while onsite sweeping, it is important that the job be done professionally and honestly. 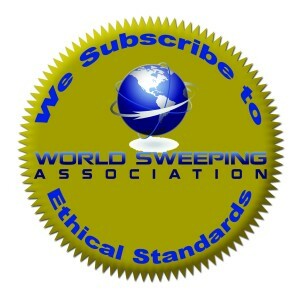 Click on this link to download a PDF version of the WorldSweeper/WSA Ethics Statement. Also, please feel free to contact the World Sweeping Association office for more information about our Ethics Program or any other aspect of the World Sweeping Association. To do so, you may call, toll free, to 866.635.2205; alternatively, send an email to director@worldsweepingpros.org.